Freezing foods is a great way to cut down costs on your grocery bill, reduce food waste, and to make your life just a bit easier! But, there is a process one should master when attempting to freeze their foods. But have no fear, Sustainable Connections is here! We would like to help answer all of your pressing freezer questions. First things first, you should know what shouldn’t be frozen. Salad greens and crisp raw veggies that you will use for salads and sandwiches. Defrosted frozen greens and crisp veggies have a limp texture, so planning to cook them is where it’s at! Eggs that are still in the shell should definitely not find a home in your freezer. This will lead eggs to expand and crack, and no one wants frozen egg yolk hanging around. Hard cooked egg whites will also become tough and rubbery. Some dairy items are not suggested to freeze. Items such as sour cream, cottage cheese, and heavy or whipped cream. These products will begin to separate once they are thawed after freezing. Egg based sauces, such as mayo will separate and curdle once defrosted. Soft herbs, such as parsley, cilantro, and basil will be okay if cooked into the dish but will be mushy on top as a garnish. 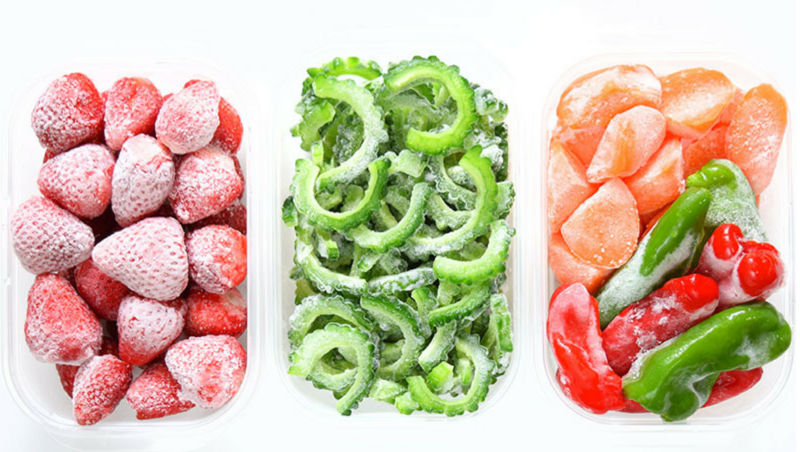 Now that you know what you cannot freeze, it’s time we talk about how long foods that can be frozen should stay in the freezer for! Butter and margarine can be frozen for up to 3 months. Grated and blocks of cheese can be frozen for up to 4 months. Grated cheese can be used straight from the freezer. Most bread can be kept in the freezer for up to 3 months, unless it is a crunchy bread like French bread. Bread can also be toasted straight from the freezer! Store milk in the freezer for up to 1 month. Defrost in your fridge so bacteria wont grow and shake well before using. Raw pastry will freeze for up to 6 months and will take 1 hour to thaw. Hot dogs, either opened or unopened can be frozen for 1-2 months. Deli slices, either opened or unopened can be frozen for 1-2 months. Bacon and sausage (raw from chicken, turkey, pork, and beef) can be frozen for 1-2 months. Ground meats like beef, turkey, veal, pork, lamb, and mixture of them can be frozen for 3-4 months. Fresh meat such as beef, veal, lamb, pork and steak can be stored for 6-12 months. Chops can be stored 4-6 months. Roasts up to 12 months. Fresh poultry. Whole chicken or turkey, up to 1 year. Chicken or turkey pieces, up to 9 months. Soups and stews, either with or without meat can be stored for 2-3 months. And finally, we would like to provide you with our 10 tips for freezing your food! Cool your foods before freezing them. If you put something really hot into the freezer, it will only raise the temperature of the freezer and that is bad news for all of the other items already in the freeze. Only refreeze foods if you’re cooking it in between. As food begins to thaw, bacteria will begin to multiply quickly, especially if the food is at room temperature. By simply throwing the food back into the freezer, the bacteria will still survive and will reach harmful levels during the second round of thawing. By cooking the foods in between, the problem won’t be as severe because the bacterial will have been killed off during the cooking process. A full freezer is more economical to run because the cold air does not need to circulate as much, so less power is needed to operate. If you have a lot of leftover space, take plastic water bottles and fill them up halfway with water. You can use these plastic water bottles later as ice blocks in a cooler if you are traveling with food. Or you can fill the freezer with everyday items, such as bread and frozen veggies to help reduce the amount of empty space. Wrap it up! By making sure your food has been properly wrapped and stored will make its life in the freezer that much longer. You can utilize large reusable freezer bags or containers that are safe to put in the freezer. Proper storage items will help stop freezer burn from occuring. Portion control. Make sure portions are proper, because it will take a lot longer to defrost soup that will feed 8 when you only have a family of three. If you made an extra-large portion of something, separate it into a few different containers and eat it ongoing. If in doubt, throw it out. Just because you froze it doesn’t mean bacteria hasn’t grown. Use your best judgement, make sure you date all of your freezer items, and if in doubt, throw it out! Stay fresh. Freezing foods do not improve the quality of the foods. So you get out of it what you put in. Don’t freeze something that is about to spoil, but rather fresh foods that will still taste good when frozen and heated up the second time. Friendly labels. This is only going to benefit you in the long run, even if it is a hassle in the moment. Label your foods with the date you put them in the freezer or else you may run the risk of leaving it in there to collect freezer burn dust. It will benefit you to make sure your food still taste good and so that it stays out of the landfill. Defrosting is a must. If you notice that ice had been building up in your freezer, you should make sure you defrost your freezer every now and then. Don’t worry about the food already in there, it will hold its freeze for a couple of hours while the freezer defrosts. In an emergency, like if your power goes out, just don’t open the door! It should stay frozen in there for up to 24 hours, which will hopefully be long enough for you to figure out what happened to the power…. Pro Tip! Freezing is a great way to keep using produce even when it is not in season. So buy those summer berries in bulk, store them properly, and enjoy well into the fall, winter and even spring! We hope you learned a lot and are excited to go on this freezer journey with us! Happy freezing and happy eating!